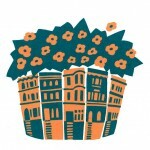 The Lefferts Manor Association will be having it’s Spring Meeting on March 24th at 10am. Find out what we’ve been up to and what’s cooking for the spring/summer season in our neighborhood. Invited guest speakers include representatives from the Prospect Park Alliance, the Transit Police, the Flatbush Merchants Association (FEPMA), and the 71st Precint. The meeting will be held at the Church of the Evangel, on Bedford Avenue between Hawthorne and Winthrop.